At TrueCoach we love efficiency. It's actually the love of efficiency that started our quest to build a tool that would help coaches like you spend less time programming with spreadsheets (or worse). Think of the keyboard shortcuts below as a way to make using TrueCoach and programming for your clients even easier! To access these shortcuts, go ahead and use your keyboard to hit (shift + ?) from your dashboard, workout builder or program tab. While you are in your workout builder or programs, this is a great way to simplify some of the steps involved in programming for your clients. 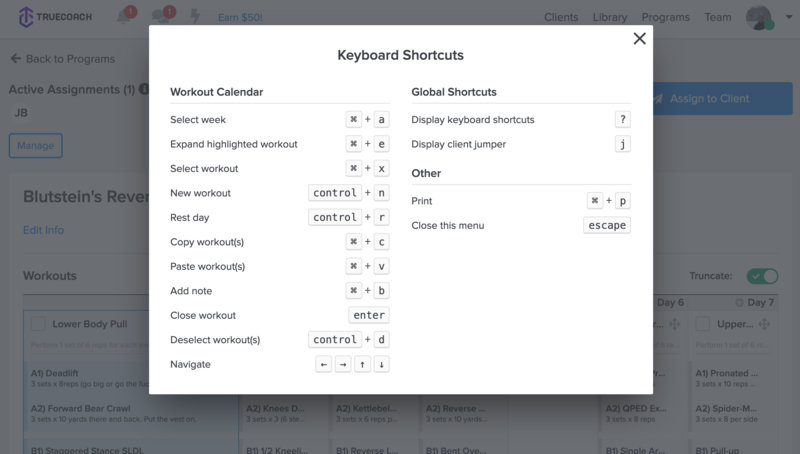 Below is a great example of how you can quickly add a new exercise using keyboard shortcuts!